Chris Mort (Honda 600), the reigning Crewe and South Cheshire club 450-1100cc champion, made a clean sweep of his three races at Tonfanau to take a big step towards retaining his crown. With three rounds gone and just three races to go in the series, Mort leads his closest rival, James Evans (Yamaha 600 ) by 18 points, 66 to 48. Life was easier for Mort with the absence of Bob Varey, the 19-year-old diesel engineer from Preston, who was unbeaten in round two, but was forced to miss this meeting through lack of funds. It was a mixed weekend for Mark Norbury (Honda 600). He finished second in the first race, just over one second behind Mort, setting the fastest lap of the race. In the second race he was nearly taken out at the first corner, but fell trying to avoid the resulting melee, so had to start the final race at the back of the grid. Grant Gaskell (Kawasaki 600), who had been fourth home in race one, behind Mort, Norberry and Evans, grabbed second spot in the second race, over 18 seconds behind Mort. Norberry managed to climb to second place in the third and final event, despite his lowly starting position, finishing under two seconds behind Mort, setting his fastest ever lap round the Welsh circuit. Gaskell was third home over ten seconds further back. There was no happy ending to the day for Norberry. The steering went on the van and the team was stranded at the circuit till the AA arrived to tow them home. Mort was in impressive form all day, leading all three races from start to finish. Chris Ganderton (Suzuki 650) stretched his lead in the Minitwins championship, with another impressive hat trick of wins from his three races. Ganderton, the 32-year-old landscape gardener from Anglesey, beating John Nicklin (Suzuki 650) in all three races. He was over ten seconds in front in race one, 11 seconds clear in race two and then just under 14 seconds ahead in the third outing. As in the previous round in May, Ganderton was also keen to take overall victory in all three combined Minitwins and Steel Frame 600 races. In race one Ganderton was the first man home, beating Dean Ephgrave’s Steel Frame by just over four seconds. Ganderton won race two, over six seconds clear of another Steel Frame racer, Tony Griffiths. Ganderton completed the clean sweep, again beating Griffiths, this time by almost two and half seconds. Ganderton tops the Minitwins on 68, 13 ahead of Nicklin. A win and two second places were enough to take Dean Ephgrave to the top of Steel Frame championship on 54, one ahead of Tony Griffiths, who a took two wins and a second place. Ephgrave beat Griffiths by half a second in race one, but Griffiths had his revenge in race two, beating his rival to the flag by a quarter of a second. Ephgrave set the fastest lap at an impressive 92.47mph in the decider, but Griffiths beat him to the line by just over two seconds. Nick Bramley on his very special BSA Bantam 186 stretched his lead in the Classic 125 and 250 Singles class with a hat trick of wins. He now has 60 points, eight more than Mark Capewell (NSU 250). Carburettor problems forced Caron Roberts to pull out of the first race, but she bounced back to take third place, behind Bramley and Capewell in the next two races. Ted Cornes (Suzuki) moved to the top of the Classic 250 twin class, thanks to a hat trick of wins. Caron Roberts chased him home in the first two, but a broken piston ring put her out of race three. Cornes won race one by just seven tenths of a second and it was closer still next time out, when his margin of victory was just three tenths of a second. Cornes has 58, three more points than Roberts. Second home in races one and two was Ben Cole (Honda), with Adrian Day (Honda) runner up in race three. Sarah Measures (Yamaha), who was leading the series coming into this meeting, but three fourth places took her to 49 points, one behind Griffiths. Another hat trick of wins for Derek Heap (Rob North BSA 930) stretched his lead at the top of the Classic over 501cc class. He beat Paul Johnson (Rob North Triumph 750) in all three outings to take his season’s tally to 60,14 more than Mick Crompton (BSA 750) who was third home each time. John Price was leading both the 400cc Supersport and Forgotten Era 251cc-500cc classes coming into the meeting. Two hat tricks on his Kawasakis helped him tighten his grip on both championships. He was 17th on the grid for the first 400 Supersport race, but by the second lap he had taken the lead, going on to beat Ben Cole home by over 13 seconds, setting the fastest lap of the race. Price took victory in his next two races, beating Cole by almost six seconds in one and then Paul Odlum in the other by over 17 seconds, putting in a lap at 91.16mph in that third and final race. Price now leads that class by 16 points from Phil Millard, who notched up two thirds and a fourth from his three rides. Watched on by his wife, Jean, children and grandchildren, Price won his all three Forgotten Era races and in fact they only race of the day he failed to take overall victory was in the second Forgotten Era outing, when Dean Culley on his Suzuki 750 beat him to the chequered flag by just over three seconds. Price came close to the class lap record of 92.04mph, with a lap at 91.74mph in his first Forgotten Era outing. Price now has maximum points in both classes and leads the FE class by 11 points from Phil Millard. Steve Birtles (Yamaha 1000) could not match the pace of Price’s little Kawasaki, but he was unbeatable in the big bike class. He beat Dean Culley (Suzuki 750) in races one and two and then headed home Marc Taylor (Yamaha 1000) in the third. Birtles leads the series on 40 points with Paul Myler (Suzuki 1100) second on 29 after taking three fourth places. Culley is third three points further back. There were three different winners in the three Forgotten Era up to 250 class races. Corey Lewis (Kawasaki 250) won the first from Dave Edwards (Honda 250) by over a lap. Dave Edwards won the second, the only rider to finish and then Huw Edwards (Rotax 250) appeared on the scene to win race three by a lap from Dave Edwards. Dave Edwards is now clear leader on 64 points, 27 clear of Huw Edwards, almost enough to take the title. Dean Culley (Suzuki 750) moved to the top of the Forgotten Era over 501cc class, thanks to a second place and two wins. But just four points cover the top three in the title chase. Steve Birtles (Kawasaki 750) failed to finish in his second ride and ended the day with two fourths and slipped from first to seconds in the standings, one behind Culley. Paul Myler (Suzuki 1100) had a fifth and two thirds to end the day on 51, four down on the leader. 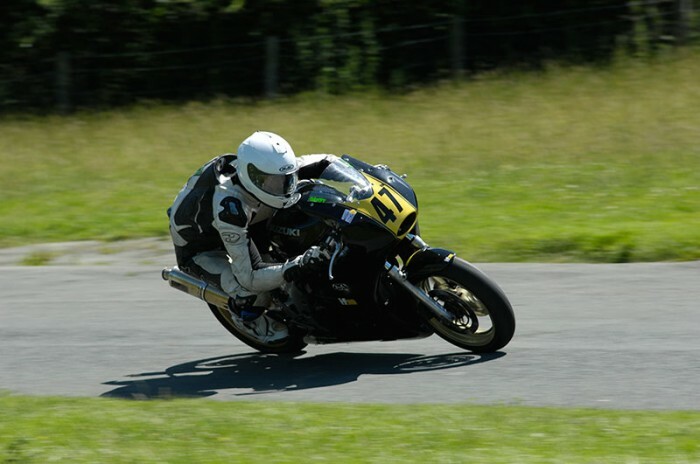 Derbyshire teenager, Sam Grief was out in the Racing 50 class on the home built Kreidler 50 and in the 451-1100cc class on Mike Chorlton’s Triumph 600. Eventually Grief pulled away to take the win, 30 seconds ahead of Bainbridge, with Kennaugh third. Grief, on a much improved machine, pulled away early to take the win in race two, leaving Kennaugh and Bainbridge to have a fierce battle for second and third. Bainbridge finally grabbed second place. Grief completed his hat trick in race three, Bainbridge second and Martin Robins third after Kennaugh pulled out on the last lap. Ernie Parry, a very experienced racer, notched up his first sub-minute lap of Tonfanau on his historic Minarelli. Grief had his second ride on the 600cc Triumph. He was faster on every lap and amazed the crowds who watched him park the 50cc machine weighing 65kg with 19bhp and then jump on the 600 weighing 200kg with 100bhp for the next race. The 50cc racers are organising a 50cc bonanza for the final Tonfanau round on August 28, anyone interested in racing their 50cc machine old, new or in-between please get in touch with Zac Grief via the Classic 50 Club website.